While the US release of the Lego Hero Factory 3.0 series figures is rapidly approaching, I still have some 2.0 series MOCs yet to share. Today I bring you Stormer XL. I made this character just because I was dying to try out a large-sized 2.0 hero, and given Stormer's Alpha Team leadership position, he made for the perfect candidate. This figure is about 11 inches tall and uses HF, Bionicle, Technic, and System parts all together. The weapon is an UBEr Blaster (heh heh). UBEr = Unbufferred Beryllium Ether. When an enemy gets hit by a blast of this stuff, he gets chemically frozen, as if put in stasis. No amount of heat will thaw him out -- it takes a special counteracting chemical process that's a closely-guarded secret of the Hero Factory. 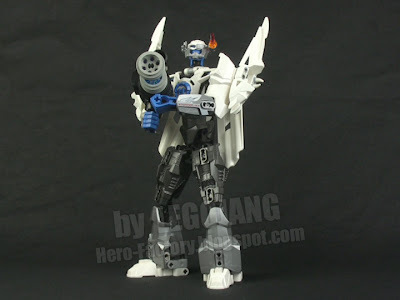 Everything about Stormer XL is upgraded, including not only his gun, but his armor and targeting computer. As I explain in the video, he has wing-like things on his back, but I'm not sure I want to say he can actually fly. I prefer to look at those parts as just part of his uniform, something to make him look more respectable and important. BTW, apologies for the annoying watermark over the photo, but I have to do something to help protect my work from all those rank, scummy thieves who try to take credit for other peoples' work. dude! i was stalking your youtube user and thinking 'when is his next vid?' but the wait is over and it was definantly worth it!. fire lord better watch out because he will have a hard job trying to absorb that ice cannon! Seriously, this is your best MOC ever, and it looks better than Rocka XL (I've seen the reviews). Will you be doing 3.0 reviews? If so, please do WD first. AND I' RIGHT TOTALLY WORTH THE WAIT! @ annonymous. It is better than your other MOCS but rocka xl is still better! YOU WERE NOT KIDNAPPED BY ZEYEK? @matanui I totlay agree. the thing is SO transparent BTW Jang,this is your best MOC yet. if this thing was up for purchase, I would DEFINETLY get it keep on MOCing! JANG, I can't wait until the 3.0. I just know that your MOCs will be 3 times better! Not that this one isn't good, but you will just have more pieces to choose from, and the pieces will be more interesting. I think you should make a MEGA WITCH DOCTOR! JANG, I know you probably get sick of my continuous posting, but can I make a suggestion? 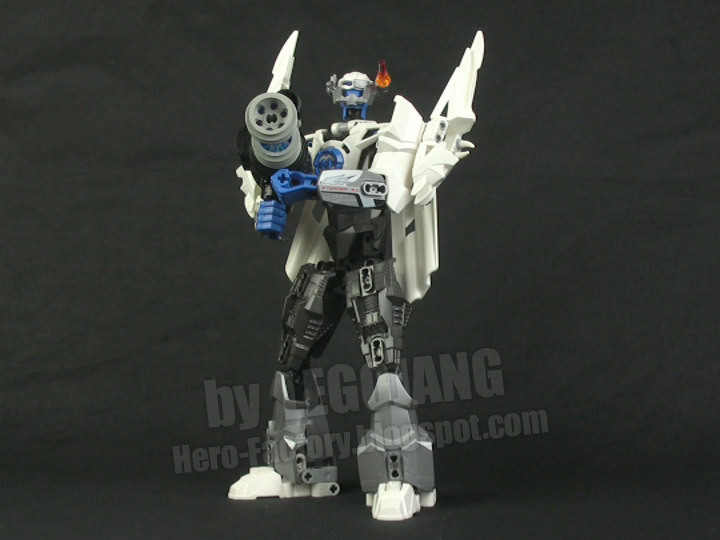 Also, I really miss Zeyek, so can you give him a new form for Hero Factory, like Zeyek 2.0? i want to see your reviews of the 3.0 sets! I think 3.0 is already here in the north america. There is going to be a new weapon piece and the villain masks are connected with the regular (not small, not large) ball joint armor piece. very nice moc, as usual. this is sort of off topic, but can you please use some hero factory limbs and armor pieces and other old bionicle parts to make new, movie accurate toa/toa nuva? i tried that with pohatu nuva and it looked epic. i just wanted to use the new 5 fingered hands for something, and it makes a big difference. i would try with rahkshi too, but i don't have any other than yellow. Please take into consideration! guys i know this is a bit off subject but have you seen the lego hero factory website? they already have two comercials and product info. When they come out in july i'ma run down to tesco and buy raw-jaw. might want to post a video or pic or something, but the minifigure pistols from lego agents can attach 2.0 helmets without headgear PERFECTLY. it would be great for fans to know. By the way, since I didn't say it in the last post, I'm new to your blogs and I pretty much became an instant fan. You also inspired me quite a lot for my own creations! JANG, you might want to know that there's a rumor that the 3.0 will be released next week. O_O wow...just wow... THIS THING IS AWESOME!!!!!!!!!!!!!!!!! I WANT IT! Hello well I'm a big fan if (I wrote something wrong I'm sorry I'm from Puerto Rico) I love your mocs, videos, blogs, etc. I always wanted to post a comment and hope you could read it ( i cant post comments on youtube cuss I'm only 12 and have no account my mom wont let me have on yet)realy love yor mocs especialy kalek and quadro, the drone, redox and maelstrom + gunship. 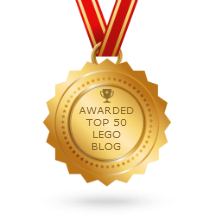 And have you ever thought of working for lego becouse i think you should .KEEP ON MOCING! @ annonymous. I got my Lego magazine yesterday, and it says it is coming in august!!!!! I got my Lego magazine yesterday and it says 3.0 comes out in august. Sorry if I downed anyones hopes of getting them in July. Keep up the supercalafregalisticexpialadocios MOCs JANG!!!!! At the beginning of your post about Stormer XL, you said, "While the US release of the Lego Hero Factory 3.0 series figures is rapidly approaching--" Do you know the exact date of the release? I was hoping it would be today, July 1st, but that does not seem to be the case. Yesterday, I got the Summer 2011 Lego catalogue, and I expected the 3.0 sets to be in there. But no, it just shows the Fire Villians. This worries me. Are the 3.0 sets coming out in the US soon or not? If anyone knows, please tell me. I hear the sets come out on Wednesday, but I'm not sure. Has anyone found the 3.0 sets yet? Stormer XL looks off the hook. Sweet UBER blaster!